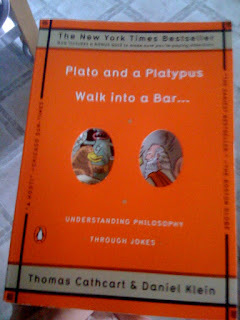 Plato and a Platypus Walk into a Bar. It is educational and entertaining, but possibly one of my favorite parts of the book are the subheadings of the chapters. Which in and of themselves are insightful definitions of the topics. Chapter 1 | Metaphysics - Metaphysics tackles the Big Questions head on: What is being? What is the nature of reality? Do we have free will? How many angels can dance on the head of a pin? How many does it take to change a lightbulb? Chapter 2 | Logic - Without logic, reason is useless. With is, you can win arguments and alienate multitudes. Chapter 3 | Epistimology - How do you know all of the stuff you think you know? Take away the option of answering, "I just do!" and what's left is epistimology. Chapter 4 | Ethics - Sorting out what's good and bad is the province of ethics. It is also what keeps priests, pundits and parents busy. Unfortunately, what keeps philosophers and children busy is asking the priests, pundits and parents, "Why?" Chapter 5 | Philosophy of Religion - The God that philosophers of religion like to argue about isn't one that most of us would recognize. He tends to be more on the abstract side like "The Force" in Star Wars, and less like a Heavenly Father who stays up at night worrying about you. Chapter 7 | Philosophy of Language - When former president William Jefferson Clinton responded to a query, "It depends on what your definition of 'is' is," he was doing Language Philosophy. He may also have been doing other things. Chapter 8 | Social and Political Philosophy - Social and political philosophy examines issues of justice in society. Why do we need governments? How should goods be distributed? How can we establish a fair social system? These questions used to be settled by the stronger guy hitting the weaker guy over the head with a bone, but after centuries of social and political philosophy, society has come to see that missiles are much more effective. Chapter 9 | Relativity - What can we say? This term means different things to different people. Chapter 10 | Meta Philosophy - The philosophy of philosophy. Not to be confused with the philosophy of the philosophy of philosophy. Anyway, I am finishing chapter 10--a priority this morning, since I want to give the book to Carl. Who, of all my friends will actually know all of this stuff anyway and probably more deeply appreciate the humor.